Amongst the many seasonal activities and things to do in Amalfi, there are a number of events worth mentioning. These festivals tend to reliably draw large crowds and if you are lucky enough to be on holiday in Amalfi during one of these celebrations, then you are in for a treat. 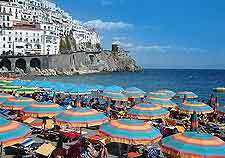 The Feast Days are always a lot of fun and these festivals include the Feast Days of St. Andrew in the latter part of June and again at the end of November, which celebrates the life of St. Andrew, the patron saint of Amalfi. During mid-August, another event of note is the Feast of the Assumption, which is staged throughout Italy as a whole and always cause for much frivolity. At the beginning of June, on the first Sunday, this part of Italy plays host to a popular traditional rowing contest, known as the Palio delle Quattro Repubbliche Marche, where the region's four republics of Amalfi, Venice, Genova and also Pisa compete for the title. Each year, this event rotates and is hosted at a different one of these locations. Therefore, the Palio delle Quattro Repubbliche Marche festival is only held in Amalfi every four years (2009 / 2013 / 2017), but when it is, you can expect huge crowds and accommodation soon becomes scarce. Each year on August 31st, the Byzantine Empire is remembered and it is on this date that the Byzantine New Year's Eve is celebrated. In the midst of the winter months and seasonal Yuletide festivities, crazy local skin divers from Amalfi make an annual pilgrimage to the ceramic crib within the famous Grotta dello Smeraldo (Emerald Grotto) and brave the chilly waters.